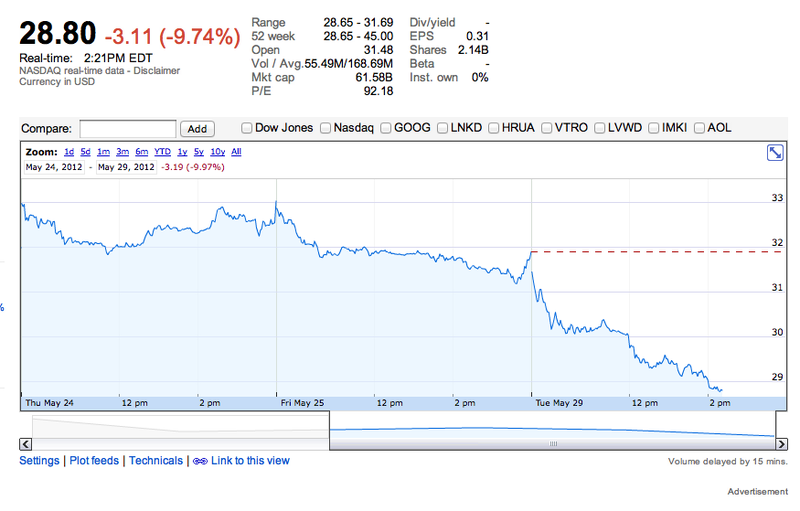 Pain, pain, and more pain for Facebook’s stock. Facebook sunk into the $20s for the first time today, declining about 9 percent as options trading started. The decline also came a day after a third wave of reports came out about a Facebook phone, which would push the company into the risky and expensive world of building hardware. The key factor affecting share prices might be options trading. Bloomberg said that puts are exceeding calls by 1.3-to-1. Puts give investors the right to sell stock at a certain price while calls give them the ability to buy stock at a given price. Puts increase in value as shares decline. Bloomberg said the June $30 puts were the most-active contracts. Like I said in a story from late last night, analysts reduced their estimates for the second quarter and I am also hearing from sources that the third quarter will be soft too. Facebook will need to boost revenue streams outside of display advertising on its own site to get shares back up. There are lots of possibilities. We could see Karma turning into an interesting gifting revenue stream, improved search becoming the basis of Google-like advertising, an Adsense-like display advertising network across the web and an expansion of payments and Facebook Credits outside of social gaming. **It looks like everyone is coming up with a different market cap for Facebook. Google and Yahoo Finance report Facebook’s market cap as being around $62 billion. The Wall Street Journal is saying that Facebook’s market cap was $80.4 billion on today’s low. I called around to sources who facilitated the offering and the correct number of shares to use is 2.74 billion. Multiply that by the current price and you get the market cap (which is different from the incorrect numbers that Yahoo and Google Finance are reporting).